Is your data secure? No, it is not! Your data faces security risks from both inside and outside your organization. What happens to my data if my servers crash tonight? What happens if a disgruntled employee deletes files? What are my employees doing on my network via their computers? Can we get a virus from email? Can someone hack into my network? Keep threats out and information in. The ever persistent threat of cyber-attacks on your network will keep you up at night. We deliver the industry best and most robust security solutions available. We’ll deliver a high performance network security platform for your core and edge which delivers flexibility to deliver the right functions at the right places. Global CTI helps you protect your business without frustrating your workers or hindering your growth. 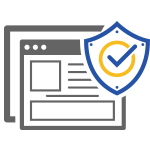 Enjoy a complete, integrated and flexible security solution with simple switching and deployment; malware detection and dismantlement; mobile security, web filtering and patch assessment. Send confidential emails with confidence using email encryption. Your message remains encrypted all the way to the recipient. You control who sees your messages, and a patented delivery slip will show you when they’re received and opened. Natural disasters. Service disruptions. Routine maintenance. Lots of things can take your servers down, but your email doesn’t have to go with it. Our Email Continuity Service is always on, simple to use and affordable. Best of all, it’s an effective way to protect your company from costly email outages. We make it easy to keep your email free of spam and viruses, 99 percent of unwanted messages will never reach your inbox. The filtering system is continually updated 2,000-4,000 times per day to ensure protection from even the newest Spammer tricks and tactics. It works on multiple platforms and utilizes proprietary detection systems, four virus-scanning engines, more than 60 filtering techniques, and wave-front detection to rid inbound and outbound email from spam, worms and viruses as well as protocol-based vulnerabilities. Even the most effective solutions will occasionally stop a valid message. When this happens, users can instantly release the message by using their daily Held Spam Report. This detailed report can be enabled per end-user and provides them with 100% visibility of all mail that has been held as spam, or “junk.” Web access to the quarantined email is also available to administrators or end-users. Your stakeholders all rely on the data and resources in the data center to effectively connect, collaborate, and create. Businesses large and small create and manage large volumes of electronic information or data. Much of that data is important. Some data is vital to the survival and continued operation of the business. The impact of data loss or corruption from hardware failure, human error, hacking or malware could be significant. A plan for data backup and restoration of electronic information is essential. The data center has become more strategic than ever, improving productivity, enhancing business processes, and accelerating change. Strengthen your data protection, streamline backup and recovery, and meet a wide range of service levels, all while optimizing your environment with a full range of platform, software, and subscription-based service solutions. Priorities and recovery time objectives for information technology should be developed during a business impact analysis. Contact Us Today for a Business Impact Analysis. Competition from outside entities to provide services, devices, etc. Implications for Network, Security, Collaboration, Data Centers, etc.